Raymond (Revisited) was our entry in a juried competition sponsored by the AIA Committee on Design entitled 2009 Ideas Competition: "Listening to the Past, Looking to the Future: A House for Today", which asked entrants to Design a new house to replace the recently demolished Raymond House (architect: Eleanor Raymond, FAIA). Regarded at the time of its construction as the first true Modern house in New England, and one of the earliest in the United States, the Raymond House was a signature work of one of the most prominent American women architects of the 20th century. 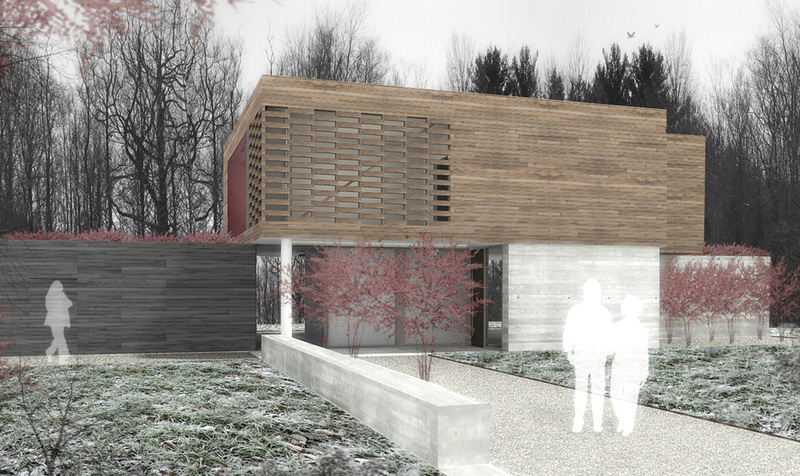 NDC's entry, designed by Jacob Wahler, was one of four projects of the 150 entrants to receive recognition by the jury. "The Jury felt this project was beautifully rendered. The project had a modesty which seemed appropriate for the size of the program. This submission was not overwhelmed by the sustainability aspects and had nice integration of the landscape with the architecture and was well supported with sustainable strategies." Revisiting the ideas and designs of Eleanor Raymond one is acquainted with what ‘modern’ has meant for so long. As the original 1931 house attested, ‘modern’ hasn't always been so metallic, glazed or sinuous, but often porous, warm, and candid. The design of the Raymond house, left only to photos now, shows the clarity with which early modern living presented its highest ideals. Ideals of uncompromising function, clarity of form, and the lightness of reaching for the space outside. In ‘Raymond House Revisited’ these ideals are presented with heightened refinement and a furthering of the possibilities the original intended. The ‘Revisited’ project also seeks to assimilate modern design with sustainable ideas of construction, design and ultimately, living. In doing so, this project celebrates history, modernity, and the future. This sketch project builds on a narrative that imagines there being ruins left on the site of the once visible Raymond house. These ruins are all that remain of the place where the new construction must begin. Instead of demolishing the ruins, the project incorporates them into the new design. These ruins appear as board-form concrete objects piercing the landscape. ‘Raymond House Revisited’ tells the story of a site found ruined but also of a project that develops a narrative around those ruins to become both modern and reflective. This sketch, ‘Raymond House Revisited’, imagines the pure simplicity of modernism from the perspective given to it by its predecessor. Its use of long rectangular forms and patterns along with its use of color and openness, nods in appreciation to one of the early American icons of modernist tradition and design, The Raymond House. 2009 American Institute of Architects, Committee on Design Ideas Competition.